Ever wanted to have a better idea about what teddy bears, Christmas lists, and miracles meant to young Joseph Ratzinger? And if not before, are you curious now? Some of the meaningful places this intimate spiritual pilgrimage included were: the charming little town of Marktl am Inn, where little Joseph Ratzinger was born; Tittmoning, where he spent early years through about kindergarten; Freising, where he attended minor seminary and was ordained a priest 65 years ago; Traunstein, where he celebrated his first Holy Mass as priest; Munich, where he served as archbishop; Regensburg, where he taught; and Pentling, where he had designed a home where he believed he would eventually retire. The group had priviledged moments they never could have expected, including a private encounter with Pope Benedict’s brother, Georg, in his home in Regensburg, and meeting the third priest ordained with the Ratzinger brothers, Rupert Berger, in his home in Traunstein. An irony, that hit those participating, was how Joseph Ratzinger, for a long time, was just “the little brother of the famous choir leader, Georg Ratzinger.” When all three were ordained, the famous one was Father Berger, since he was the mayor’s son. Until Joseph became cardinal and was called to Rome, even as archbishop of Munich and Freising, he still stood “in the shadow” of his world-famous brother. Do you know where Pope Benedict’s favorite image of the Madonna is? The answer: in a Marian shrine, known as a place of miracles in the charming-beyond-words town of Altoetting where the Ratzinger family, including little Joseph, and his siblings Georg and Maria, would visit at least once a year. In this place in 1489, two little boys who had been killed, one in a farm accident and another drowning, had been brought back to life after they were brought before the beautiful image of the Virgin Mary of Altoetting. In fact, today, this place leaves an impression due to all the trinkets (ex-voto) left on the walls outside the shrine as signs of gratitude for miracles that occurred through Mary’s intercession. (Lighting candles is the gesture one does for obtaining miracles, while an ex-voto represents a sign of a miracle received.) Throughout and surrouding this shrine, there is not actually enough space on the walls to accommodate all the tributes. The wealthy gave items of silver to show their thanks, whereas the less well off and even very poor people, often drew little pictures to show their gratitude. One sees pictures of hospital beds, or even body parts to reflect recovery of the ill, as well as pictures of babies – even photographs from a few months ago — for babies who were delivered safely after complications or of parents who couldn’t have children, and then all of a sudden found themselves expecting. Moreover, there are painted images of people who were saved from torturous situations in times of war, struggle, or even recent tsunamis, whose survival was attributed to Mary’s intercession. The home in Marktl am Inn is where Joseph spent his earliest years — he was two years old when he and his siblings crossed the street to look at the Christmas decorations of a small department store just opposite their parent’s home. The apple of the little one’s eye: a teddy bear in the window. Every day, little Joseph would watch and admire. But then one day right before Christmas: tears. Why? The teddy bear was gone… . In Germany, litte ones get their presents after Holy Mass on December 24th. At this moment, little Joseph’s source of sorrow was removed, when instead he experienced great joy as the teddy bear was under the family’s Christmas tree. “I promise I’ll be good” was written in his Christmas list at the age of seven. (A promise Joseph Ratzinger certainly kept.) In exchange for his good behavior, the three things he requested very articulately: a vestment for when he would play Mass with his brother Georg, the Mass missal translated into German so he could understand the Latin, and a specific image of the Sacred Heart. Tittmoning, a small town on the Salzach River, on the Austrian border, where the Ratzinger family lived from 1929-1932, (until about the time that Joseph entered kindergarten), is the place Benedict described as the ‘Wonderland of His Childhood.’ Before going to school, he would stop and pray in church. Here, he began to appreciate the Mass more and more, especially as he observed his older brother serve and his parents sing in the choir. Also, in this town, where young Joseph began to fall in love with the liturgy, is a Marian Shrine, where he, with his mother and siblings, daily used to go to pray the rosary. We pilgrims braved the steep way up, but it was more than worth it. On the way back, we passed the rapids of a small river running downhill through a forest, giving shade in the summer. We also visited Auschau am Inn, at the foot of the Alps, where the family had to relocate in 1932, due to Mr Ratzinger’s outspoken criticism of Nazism. Benedict’s family, especially his father, a policeman, always did everything they could to resist the Nazis and keep the family as distant from them as possible. Even this move to Auschau was done so that if soon there would be war, the family could have a home that supplied them with natural resources and food to live on. In this home, Joseph was often found in solitude reading, his passion, and was a regular reader of “Der gerade Weg”, the most outspoken Catholic Anti-Nazi publication. After Hitler rose to power, its editor, Fritz Michael Gerlach, was arrested and died in the Dachau concentration camp as a martyr; his beatification process started in 2009. Mr Ratzinger always said no to any Nazi offers. The only thing he allowed was his wife to be part of a women’s group which prayed the rosary. The priests on the pilgrimage had a beautiful moment concelebrating Mass in the Church in Traunstein where Benedict celebrated his first Mass, after having been ordained in Freising. It was an interesting story how we came to have this Special Mass on Sunday. While in Rome, during the Mass of Saints Peter and Paul, Robert Moynihan and Deborah Tomlinson of Inside the Vatican found themselves—completely by chance–seated next to the pastor of the parish in Traunstein. The Pastor of St. Oswald’s told them to come instead on Sunday to Traunstein, rather than Saturday, which was the original plan, so that after the Mass, he could show the group different sites—such as where Pope Benedict’s parents spent their last days–and we could have a nice Bavarian lunch together. At this restaurant, historian Michael Hesemann, who is close to the Ratzingers, shared yet another personal detail he knows well, a delicious one. The German author ordered “Kaiserschmarrn,” a sweet dish he said is Pope Benedict’s favorite. Another gastronomic surprise was trying the white sausages, which apparently, even now, Benedict enjoys in the Vatican, often brought by his brother or by his personal friends from his time in Bavaria. Another touching moment was learning about Joseph Ratzinger’s close relationship with his sister, Maria, who was at times like an assistant to him, not to mention also housekeeper and personal secretary. Despite being an accomplished professional, she was happy to instead dedicate her time to performing many tasks that would have taken away from his scholarly endeavors. The small group participating also looked at the richness of the works and discourses of Ratzinger and later Pope Benedict, through interactive discussions led by Robert Moynihan, Vatican expert and Founder and Editor-in-Chief of Inside the Vatican magazine, to enrich their understanding of the Pope Emeritus. Those participating also enjoyed various other memorable Bavarian Moments, along with time for free exploration, eating well, and time of reflection. For instance, we visited the Weltenburg Monastery, on the beautiful Danube River, which brewed the first Bavarian beer a thousand years ago–and still continues the operation–and which served as a retreat for Professor Joseph Ratzinger and his doctoral students during the years when he was a professor in Regensburg. There was also a very moving visit to Augsburg to see Mary, Untier of Knots, who is so important to Pope Francis that he has made sure she is in Santa Marta, as well as a fun stop at Neuschwanstein Castle, which was the inspiration for the castle in Disneyland. All in all, this journey, retracing Joseph Ratzinger’s footsteps, and meeting many of those involved in Ratzinger’s journey from the past through the present, between Rome and Bavaria, has left—as the pilgrims all expressed—an impact for them, they will never forget…. 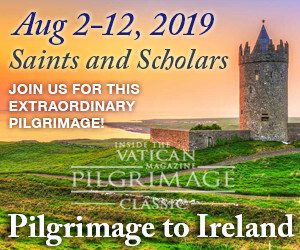 Please click here for more information regarding our upcoming pilgrimages. 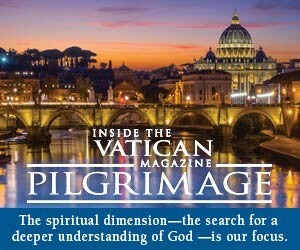 Join Inside the Vatican Pilgrimage for a once-in-a-lifetime Journey!